Joan Feynman (born March 31, 1927) is an American astrophysicist. She has made important contributions to the study of solar wind particles and fields; sun-Earth relations; and magnetospheric physics. In particular, Feynman is known for developing an understanding of the origin of auroras. She is also known for creating a model that predicts the number of high-energy particles likely to hit a spacecraft over its lifetime, and for uncovering a method for predicting sunspot cycles. Feynman was raised in Far Rockaway section of Queens, New York City, along with her older brother, Richard Feynman. Her parents were Lucille Feynman (née Phillips), a homemaker, and Melville Arthur Feynman, a businessman. Her family originated from Russia and Poland; both of her parents were Ashkenazi Jews. Like her brother, Joan was an inquisitive child, and she exhibited an interest in understanding the natural world from an early age. However, her mother and grandmother both dissuaded her from pursuing science, since they believed that women's brains were not physically capable of understanding complex scientific concepts in the way that men's brains could. Despite this, her brother Richard always encouraged her to be curious about the universe. It was he who originally introduced young Joan to auroras when, one night, he coaxed her out of bed to witness the northern lights flickering above an empty golf course near their home. Later, Feynman would find comfort in an astronomy book given to her by her brother. She became convinced that she could, in fact, study science, when she came across a graph based on research by noted astronomer Cecilia Payne-Gaposchkin. Feynman earned a bachelor's degree from Oberlin College. She later attended Syracuse University, where she studied solid state theory in the physics department under Melvin Lax. During her graduate years, Feynman took a year off to live in Guatemala, where she studied the anthropology of the Maya peoples who lived there. Feynman eventually earned her doctorate in physics in 1958. Her thesis was on the "absorption of infrared radiation in crystals of diamond-type lattice structure." She also completed postdoctoral work at Columbia University. Joan Feynman spent the bulk of her career studying the interactions between the solar wind and the Earth's magnetosphere. While working at the NASA Ames Research Center in 1971, Feynman discovered that the periodic spouting of solar material known as a solar coronal mass ejection (CME) could be identified by the presence of helium in the solar wind. This was an important find because, although CME's were known at the time, they had until then been difficult to detect. After her time at NASA Ames, Feynman moved on to a number of different research posts. These included positions with the High Altitude Observatory; the National Center for Atmospheric Research in Boulder, Colorado; the National Science Foundation in Washington, DC; and Boston College in Massachusetts. Finally in 1985, Feynman accepted a position at the Jet Propulsion Laboratory in Pasadena, California, where she remained until her retirement. As part of her research, Feynman made a critical discovery about the nature and cause of auroras. Using data collected by a NASA spacecraft known as Explorer 33, she demonstrated that the occurrence of auroras is a product of the interaction between the Earth's magnetosphere and the magnetic field of the solar wind. Feynman would also help develop a new model for estimating the environmental hazards of the local space environment. This work was taken on due to the fact that high-velocity coronal mass ejections are known to cause geomagnetic storms, which can have dangerous effects on both functioning spacecraft and on any humans that may be in space at the time. Such fast-moving coronal mass ejections cause shock waves in the solar wind, speeding up solar particles and instigating geomagnetic storms as the particles arrive at the outer edge of Earth's magnetosphere. Often, the commencement of such storms is coupled with a high influx of protons, which can wreak havoc on communications systems and space flight activities. Feynman's model ultimately helped engineers determine the flux of high-energy particles that would affect a spacecraft over its functional lifetime. Her work in this area led to important new developments in the design of future spacecraft. Later in her career, Feynman studied the science behind climate change. She was particularly interested in transient solar events and solar cycle variations. Among other things, she studied the influence of the sun on patterns of wintertime climate anomalies known as the Arctic oscillation or North Annular Mode (NAM). Along with her colleague (and husband) Alexander Ruzmaikin, she found that for periods of lower solar activity, the NAM index is systematically lower. Such periods of low solar activity coincide with cooling periods for certain parts of the world; for example, this was seen in Europe during a time known as the Little Ice Age. Feynman and her colleagues also discovered a link between solar variability and climate change in ancient water levels of the Nile River. During periods of high solar activity, conditions around the Nile were found to be drier, and when solar activity was low, conditions were wetter. In 1974, Feynman became the first woman to be elected as an officer of the American Geophysical Union. She also organized an AGU committee charged with advancing the fair treatment of women within the geophysics community. Feynman has been a longstanding member of the International Astronomical Union. She was a member of a number of the IAU's subdivisions, including: Division E Sun and Heliosphere; Division G Stars and Stellar Physics; and Division E Commission 49 Interplanetary Plasma & Heliosphere. Feynman retired from the Jet Propulsion Laboratory as a senior scientist in 2003. But she continued to work, publishing as recently as 2009 on the influence of solar activity on the climate of the first millennium. During her career, Feynman was an author or co-author of more than 100 scientific publications. She also edited three scientific books. Feynman was twice elected secretary of the Solar and Interplanetary Physics Section of the American Geophysical Union. In 2002, Feynman was named as one of the Jet Propulsion Laboratory's elite senior research scientists. In 2002, she was awarded NASA's distinguished Exceptional Achievement Medal. Feynman has been married to fellow astrophysicist Alexander Ruzmaikin since 1987. She has one daughter, Susan Hirshberg, and two sons, Charles Hirshberg and Matt Hirshberg, from her first marriage, to Richard Hirshberg. ^ a b "1940 United States Federal Census - Joan Feynman". Retrieved 1 April 2013. ^ a b c d e f g h i Hirshberg, Charles (2002-04-18). "My Mother, the Scientist". Popular Science. Bonnier Corporation. ^ "Feynman biography". Retrieved 31 March 2013. ^ a b Ottaviani, Jim; Leland Myrick (2011). Feynman (1st ed.). New York: First Second. ISBN 978-1-59643-259-8. ^ "Joan Feynman - The Aurora". Retrieved 31 March 2013. ^ a b c d e f Feynman, Joan (September 2007). "Physics Matters at Syracuse University: Volume 2, September 2007; CORRESPONDENCE FROM ALUMNI, Joan Feynman, PhD '58" (PDF). Archived from the original (PDF) on 11 May 2012. Retrieved 30 March 2013. 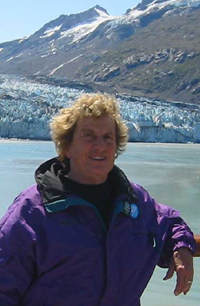 ^ a b "Joan Feynman, Caltech & KITP: Climate Stability and its Effect on Human History". University of California at Santa Barbara. Retrieved 31 March 2013. ^ a b c "Space and Astrophysical Plasmas: People: Joan Feynman". Jet Propulsion Laboratory. Archived from the original on 17 July 2012. Retrieved 5 April 2013. ^ Crooker, N. U.; Feynman, J.; Gosling, J. T. (1977-05-01). "On the high correlation between long-term averages of solar wind speed and geomagnetic activity". NASA. ^ a b Collins, David; Joan Feynman (2000). "Early Prediction of Geomagnetic Storms (and Other Space Weather Hazards)". Journal of Geophysical Research. Retrieved 31 March 2013. ^ a b "NASA Finds Sun-Climate Connection in Old Nile Records". NASA Jet Propulsion Laboratory. 2007-03-19. Retrieved 31 March 2013. ^ "Joan Feynman | IAU". Retrieved 31 March 2013. ^ Ruzmaikin, Alexander; Joan Feynman (2009). "Search for Climate Trends in Satellite Data". Advances in Adaptive Data Analysis. 1 (4): 667–679. doi:10.1142/S1793536909000266. Retrieved 30 March 2013. ^ "Joan Feynman to be June Bride," Brooklyn Daily Eagle, May 2, 1948.